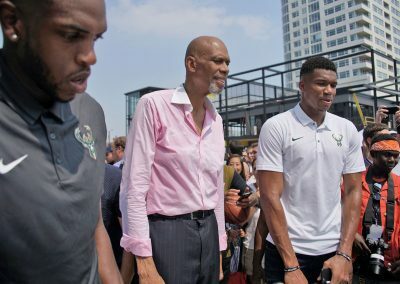 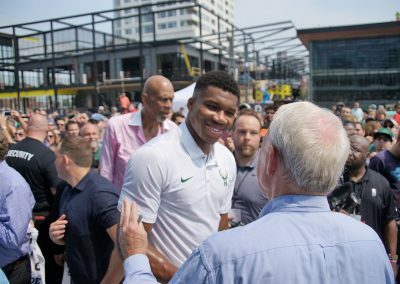 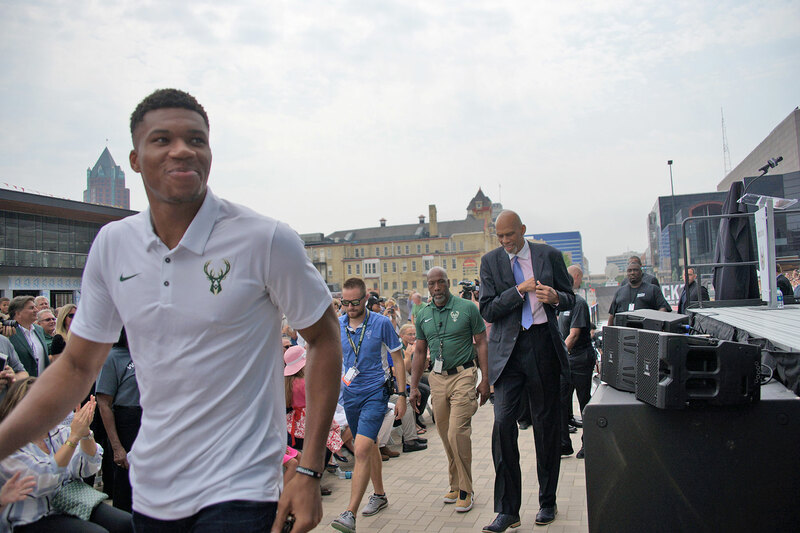 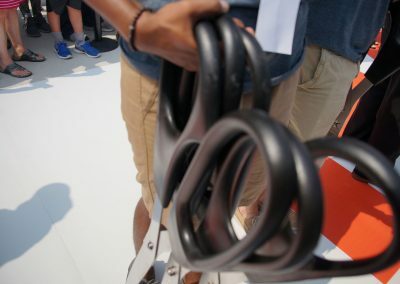 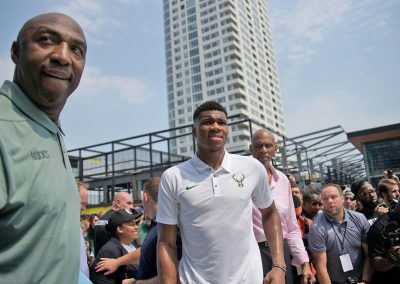 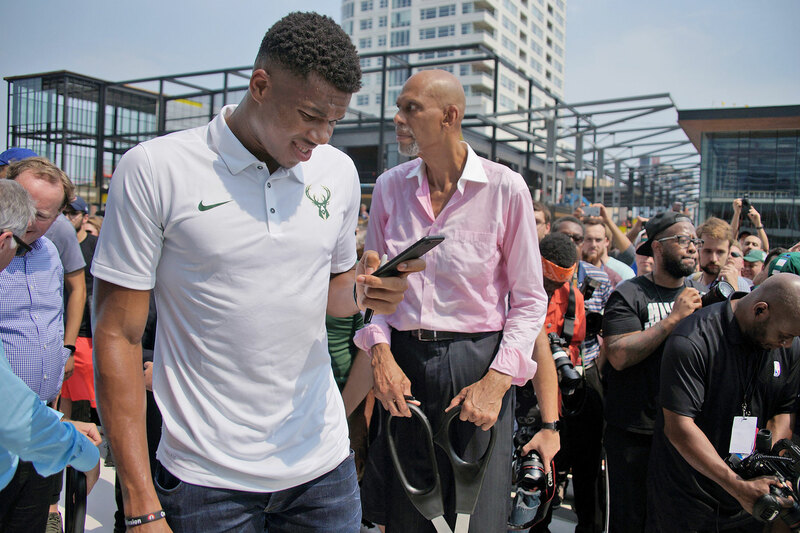 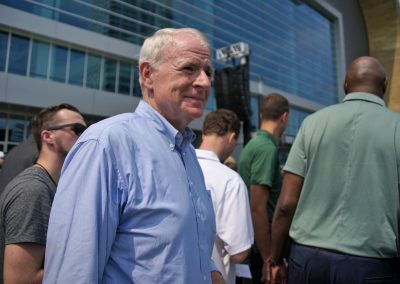 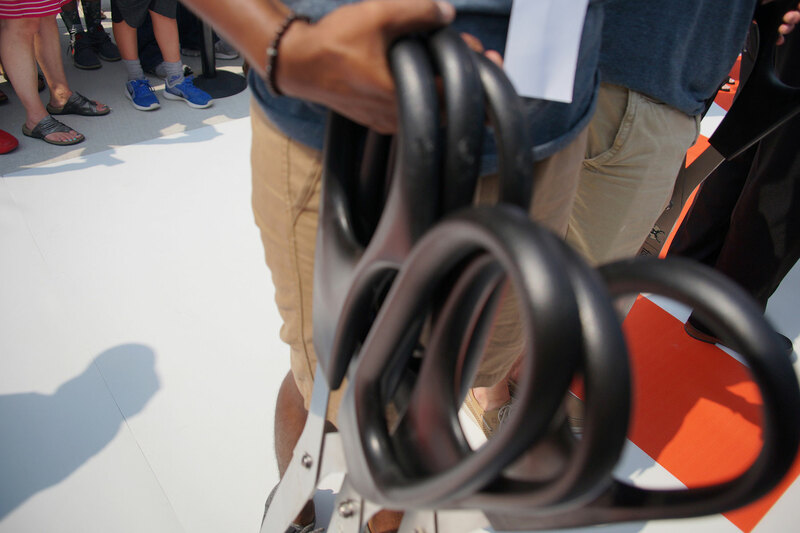 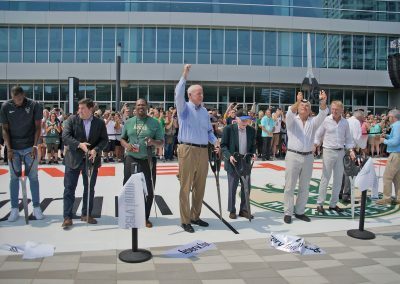 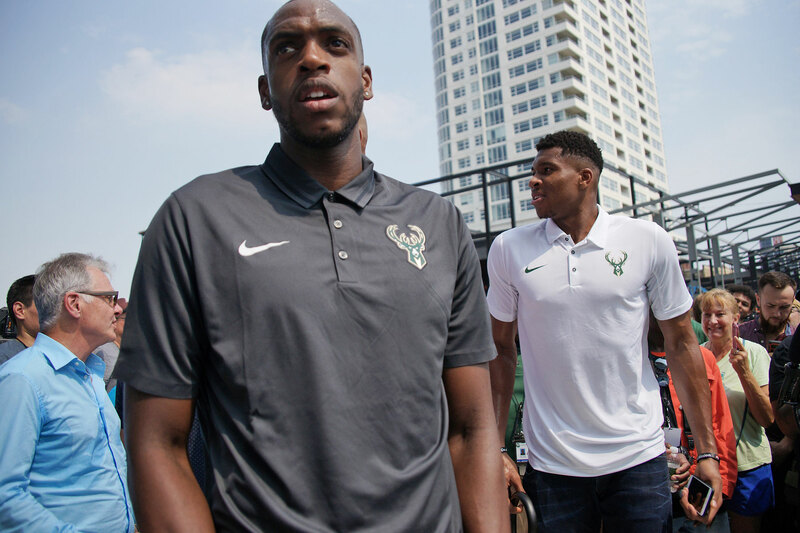 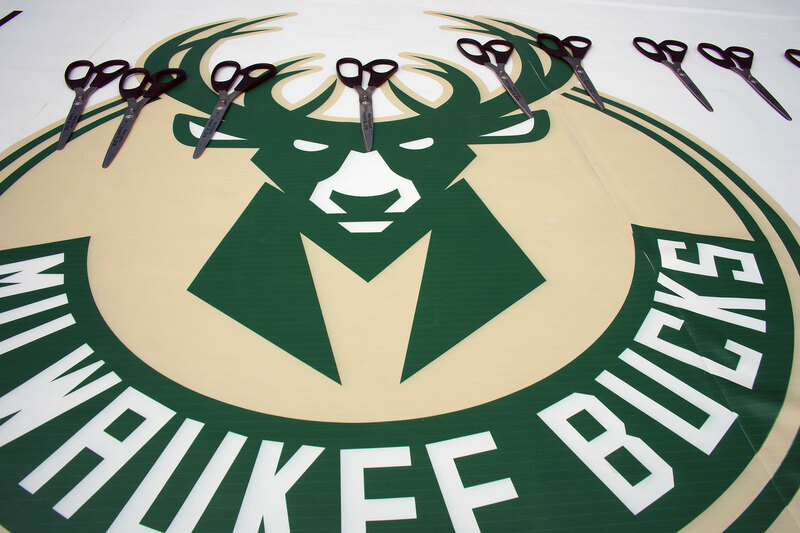 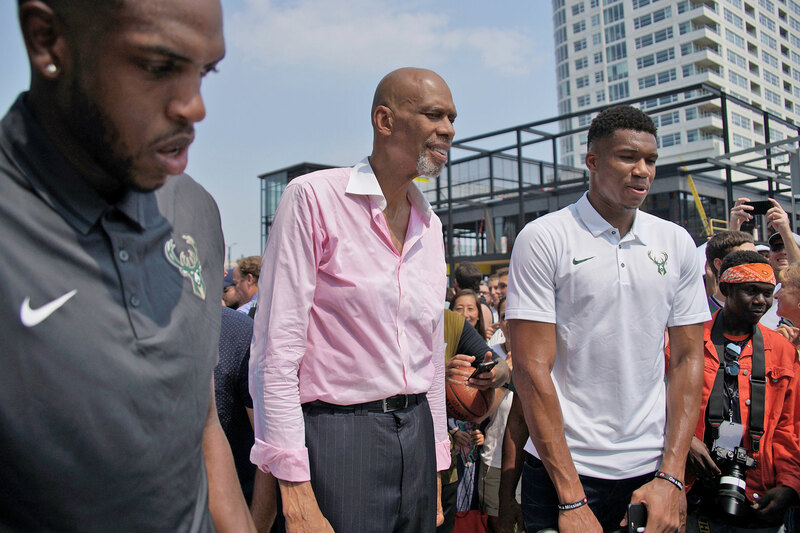 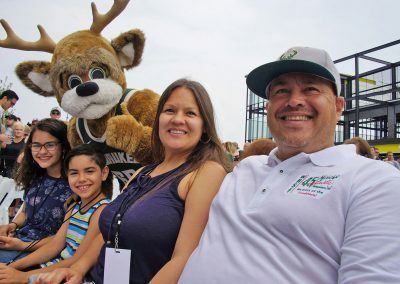 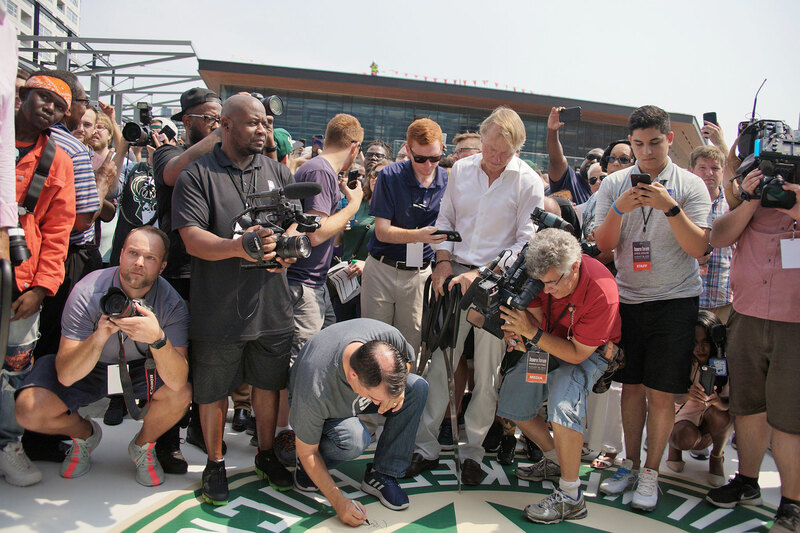 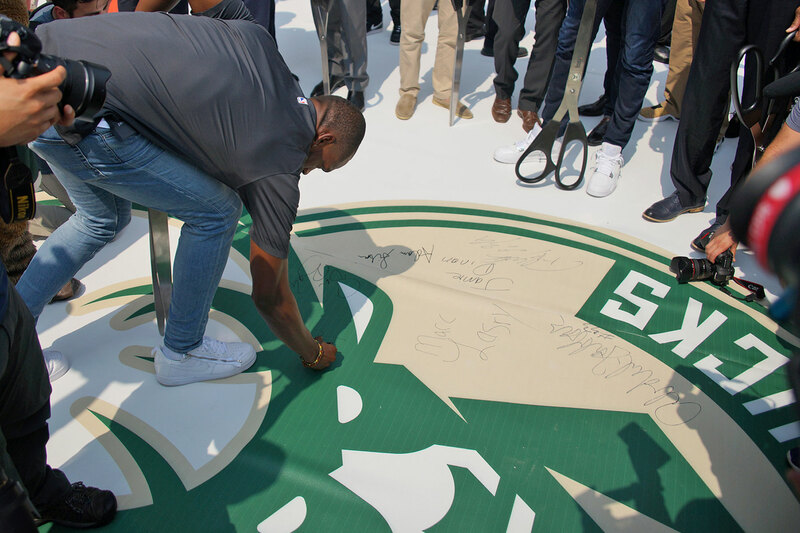 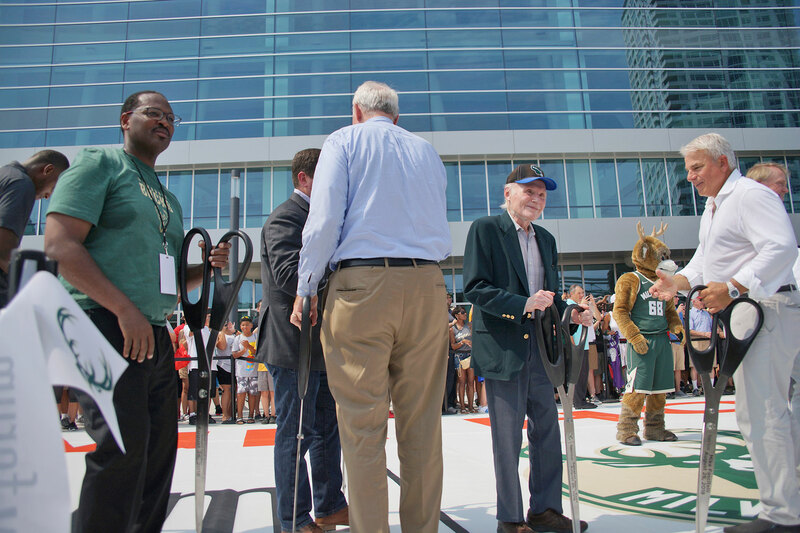 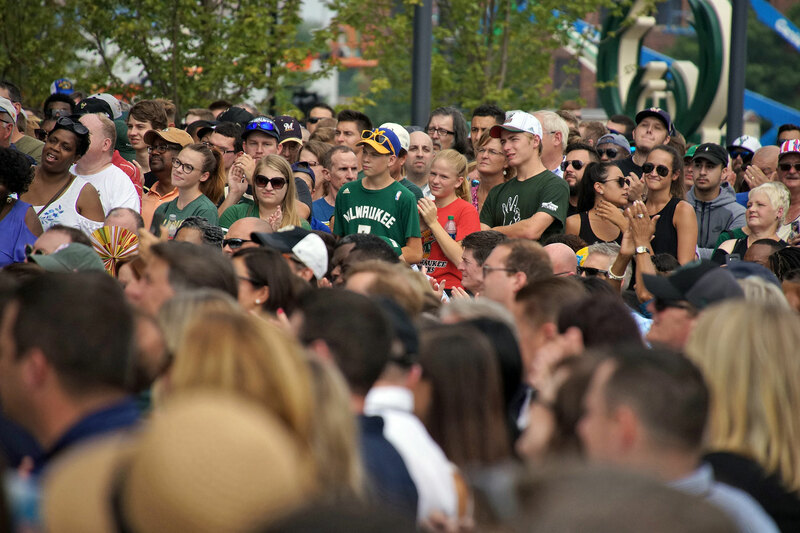 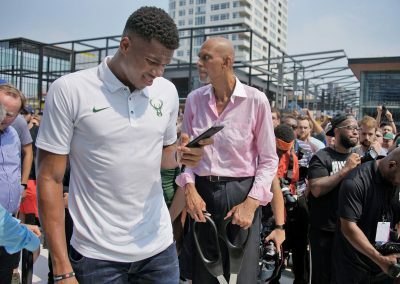 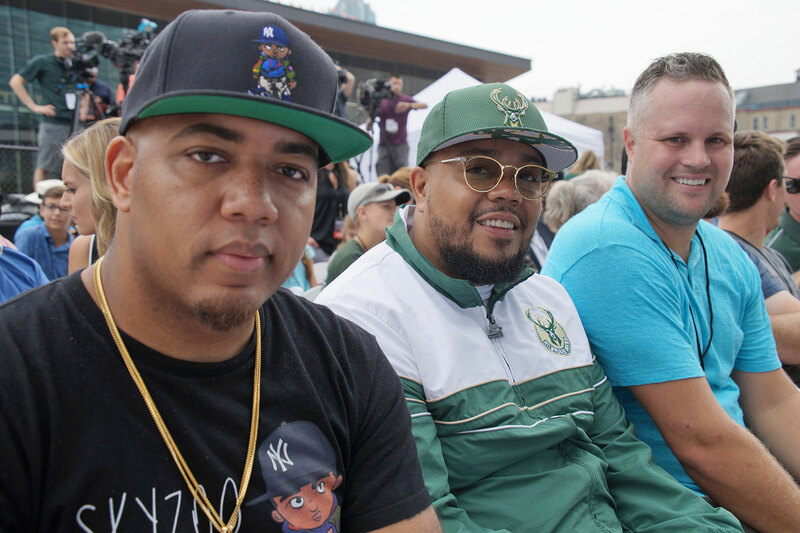 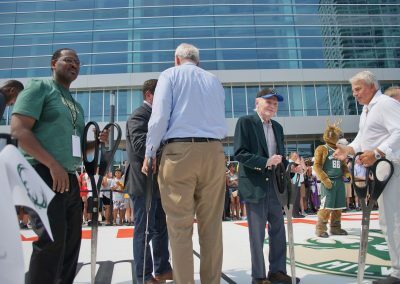 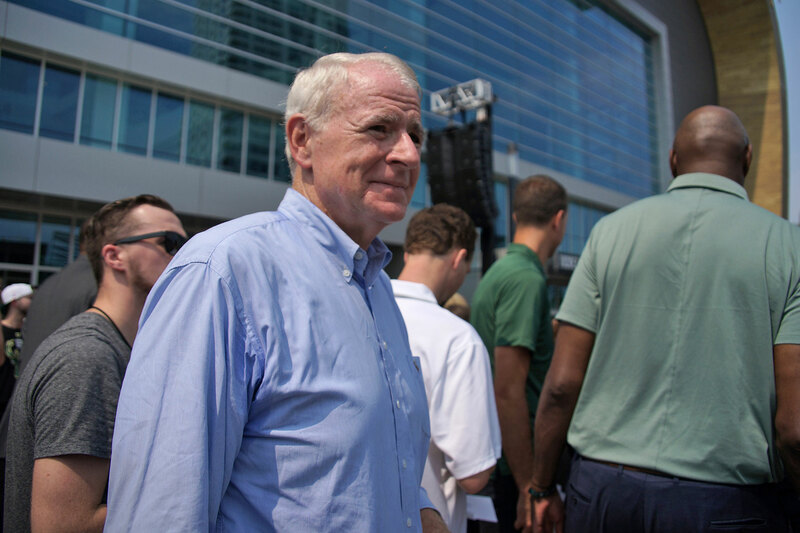 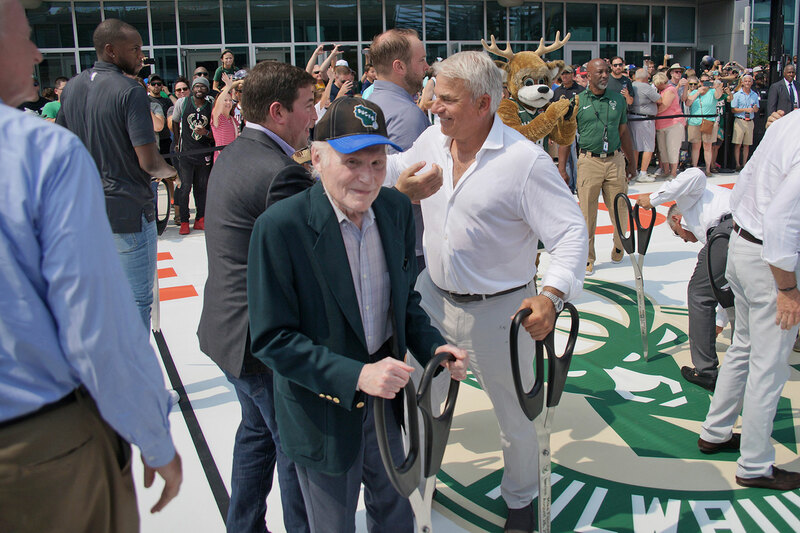 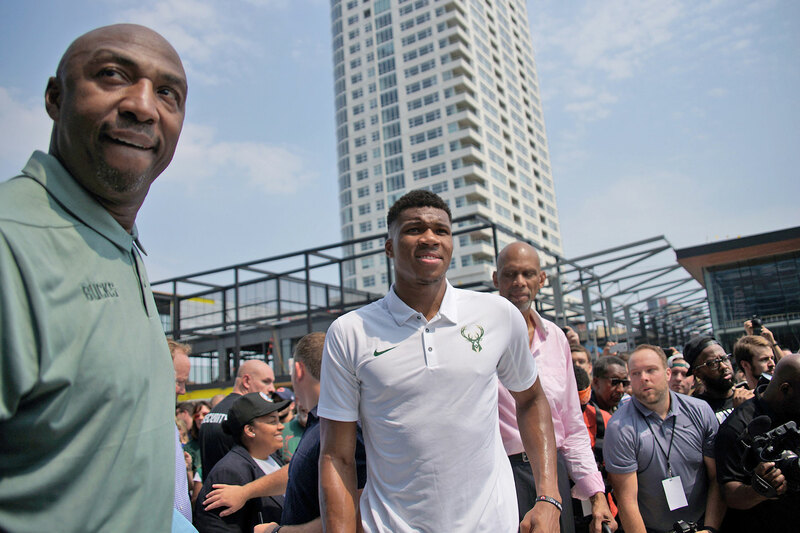 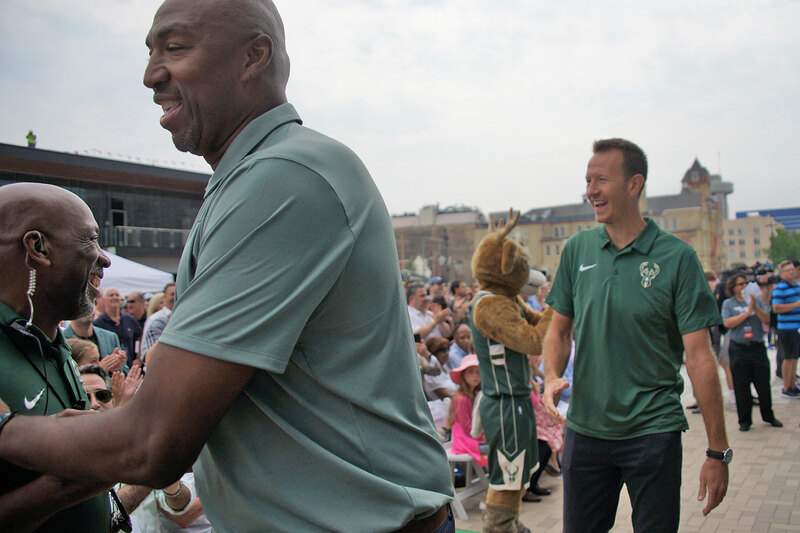 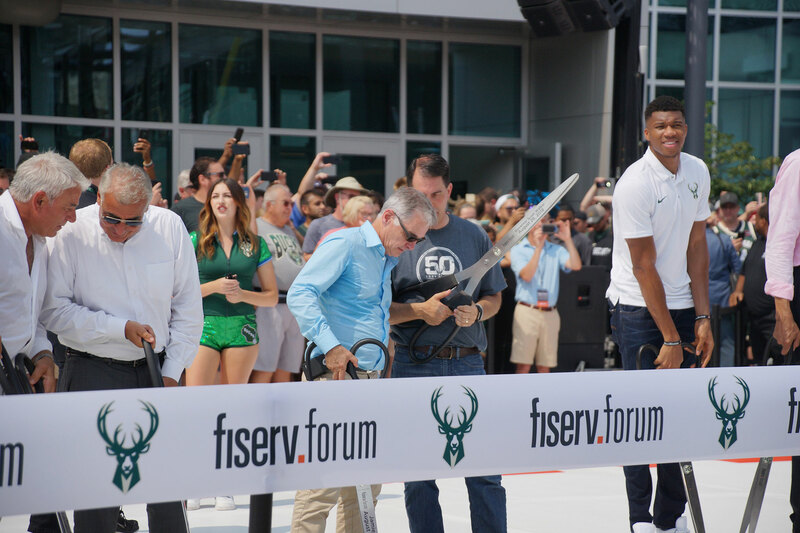 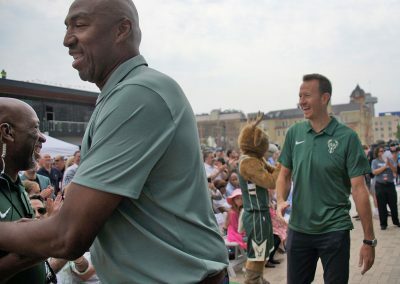 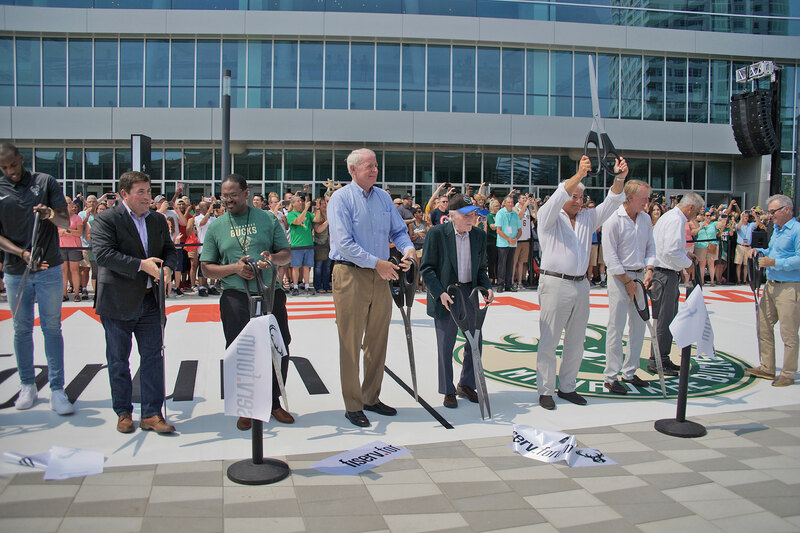 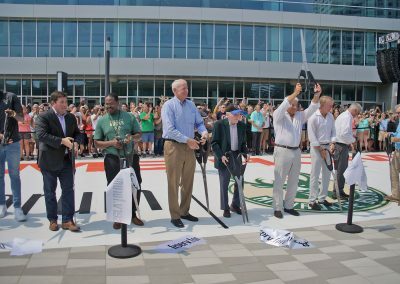 Bucks players, team owners, NBA Commissioner Adam Silver, elected officials, and alumni attended the ribbon cutting ceremony on August 26 to officially open the Fiserv Forum, Milwaukee’s new world-class sports and entertainment venue. 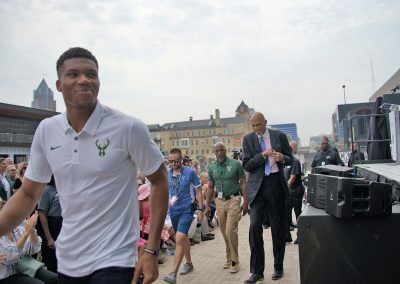 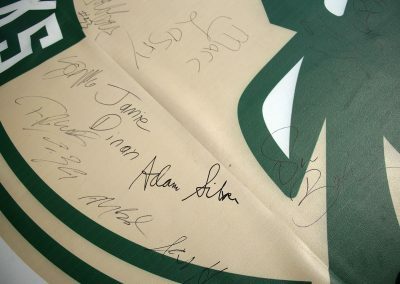 The ceremony was attended by current Bucks players Giannis Antetokounmpo and Khris Middleton, Bucks alumni Kareem Abdul-Jabbar, Vin Baker, Marques Johnson, Jon McGlocklin, Steve Novak and Michael Redd, Bucks owners Wes Edens, Marc Lasry, Jamie Dinan and Mike Fascitelli, Bucks General Manager Jon Horst, Bucks Head Coach Mike Budenholzer, NBA Commissioner Adam Silver, Wisconsin Governor Scott Walker, Milwaukee Mayor Tom Barrett, Milwaukee Common Council President Ashanti Hamilton, Fiserv President and CEO Jeff Yabuki, Bucks President Peter Feigin, and Former Bucks owner Senator Herb Kohl. 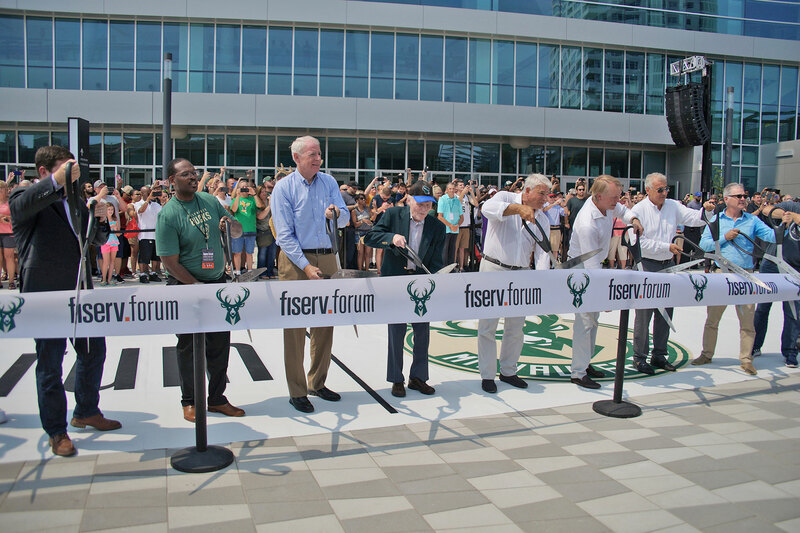 “The opening of Fiserv Forum marks an incredible moment for this community. 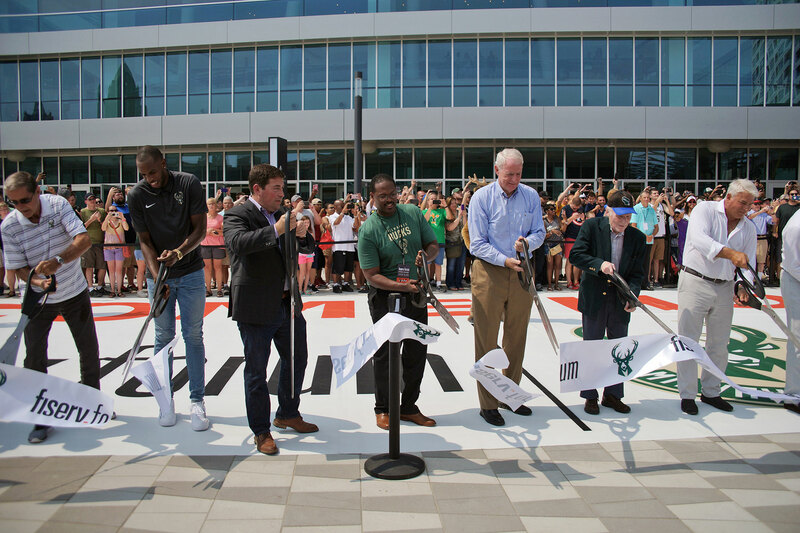 In the four years that we’ve had the privilege of being stewards of the Bucks, the opening of this world-class venue serves as our proudest achievement. 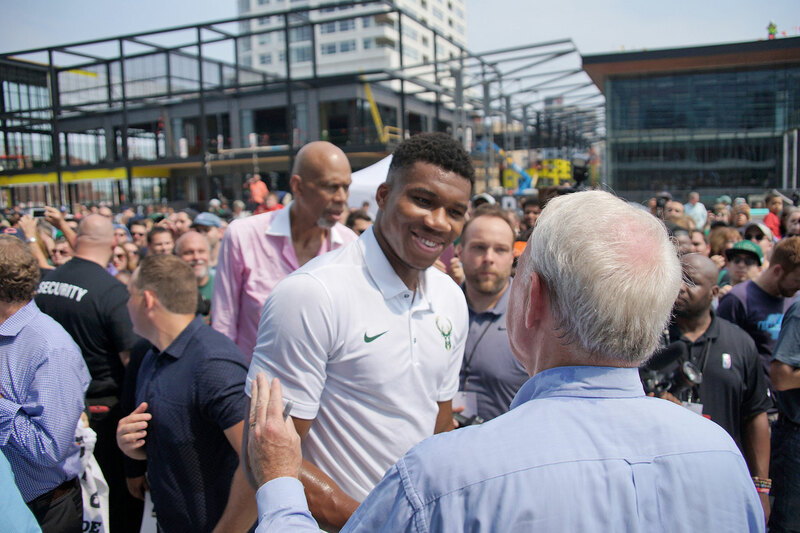 Fiserv Forum will be the sporting and cultural heart of Milwaukee, welcoming the very best in sports and entertainment to Wisconsin. 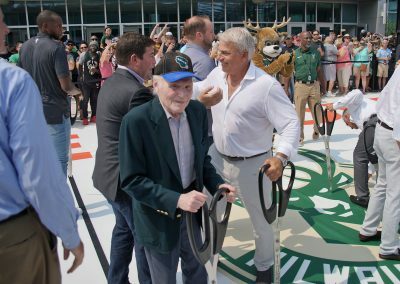 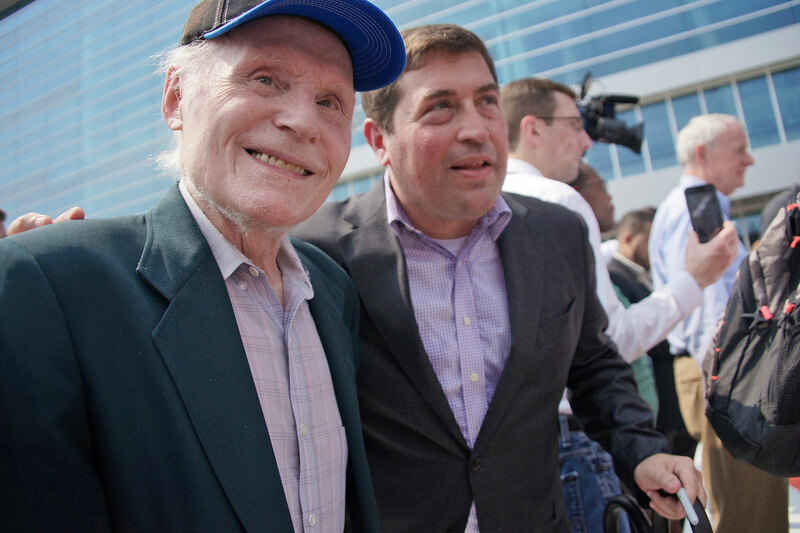 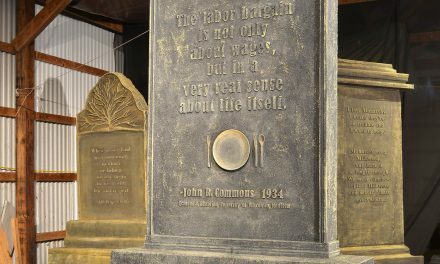 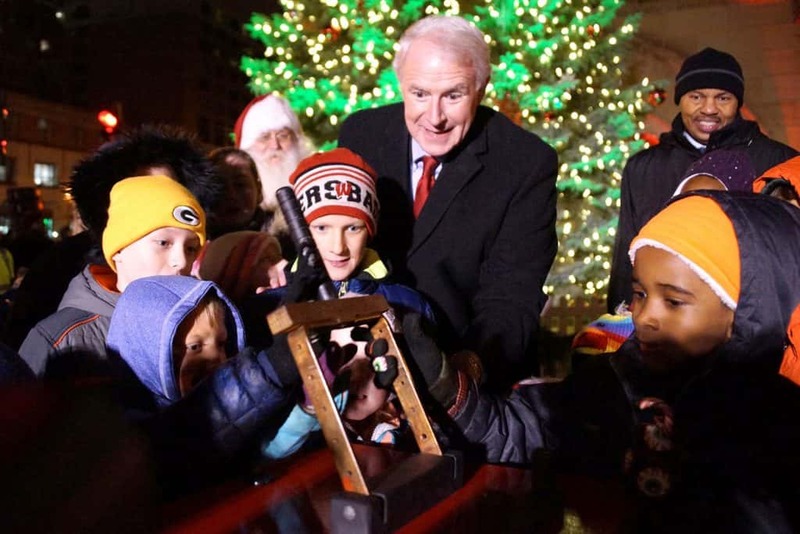 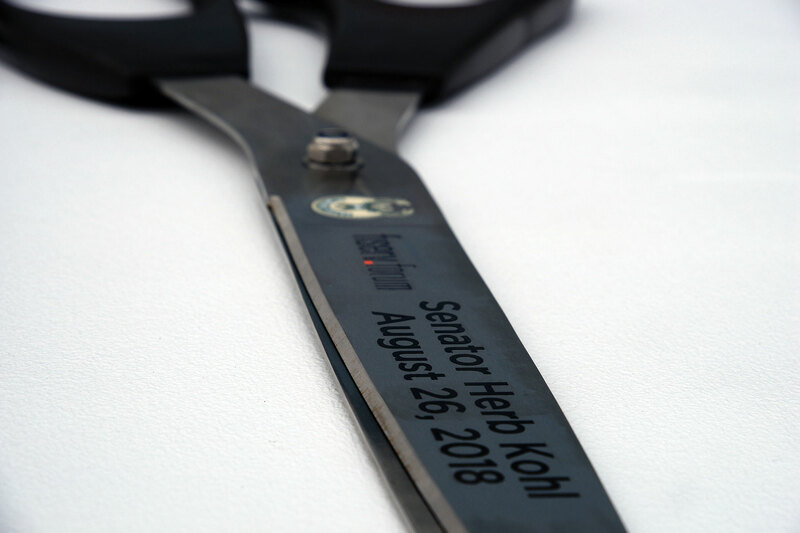 We’d like to thank Senator Herb Kohl for his extraordinary contribution to this arena, and to recognize the city, county and state leaders who were committed to this project. 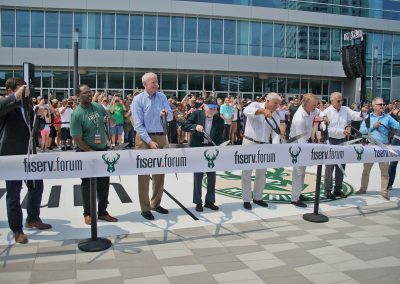 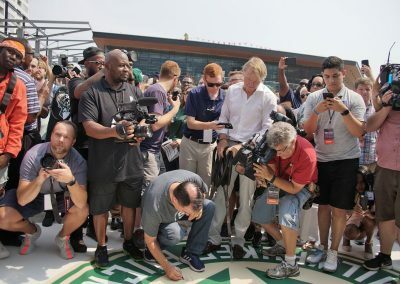 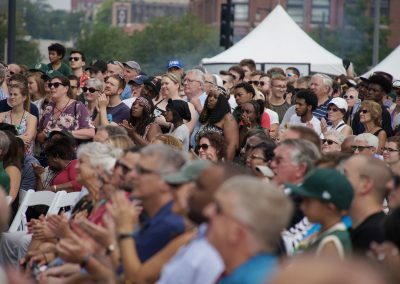 As we open the doors today, we also want to express appreciation to the dedicated workers who spent much time and energy in making Fiserv Forum a place that we can all be proud of,” said Milwaukee Bucks Co-Owners Wes Edens, Marc Lasry, Jamie Dinan and Mike Fascitelli in a joint statement. 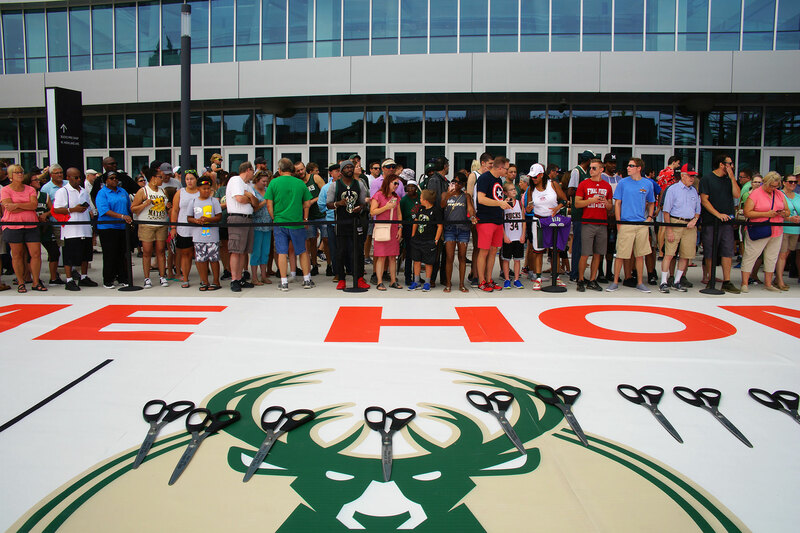 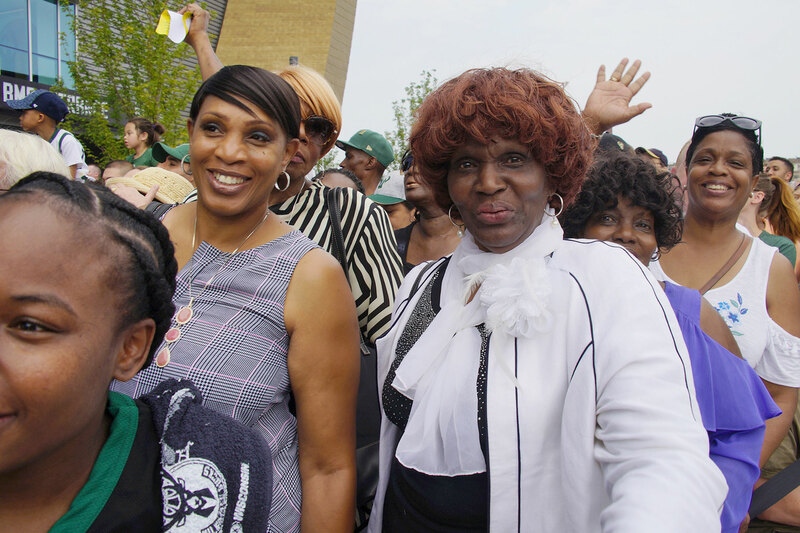 The ribbon-cutting was held next to a world record-breaking welcome mat greeting fans with the event’s “Welcome Home” theme. 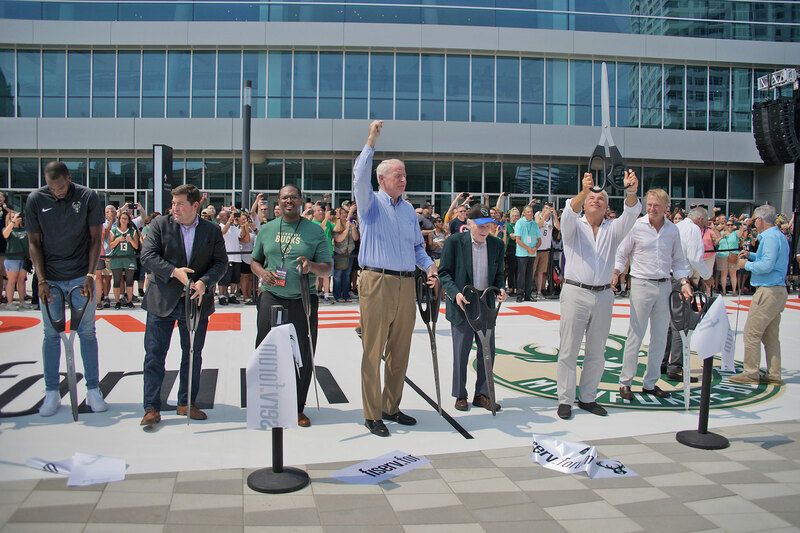 The 92-feet long by 24-feet wide mat was verified by a Guinness World Records judge as the largest vinyl floor mat. 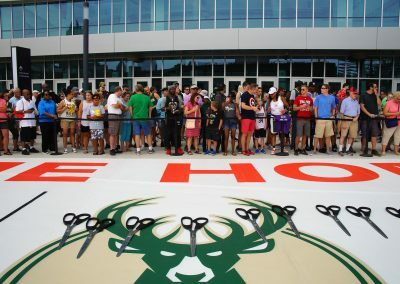 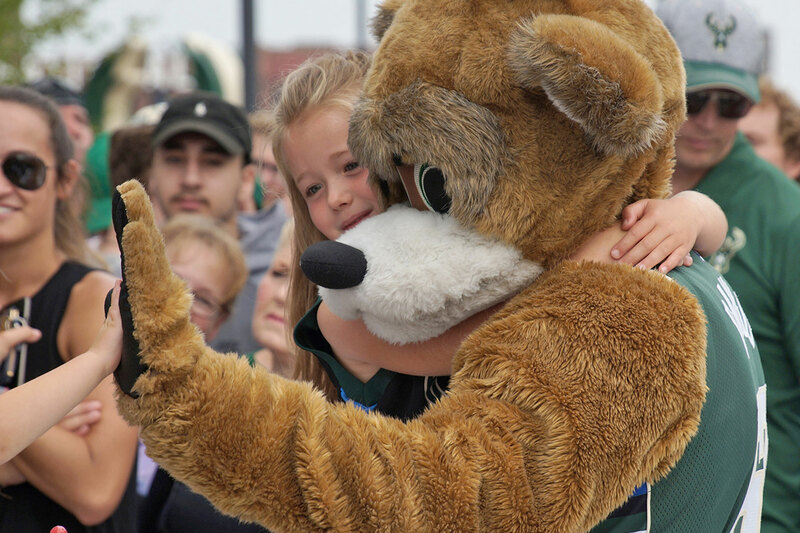 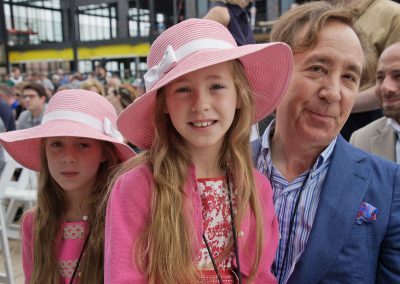 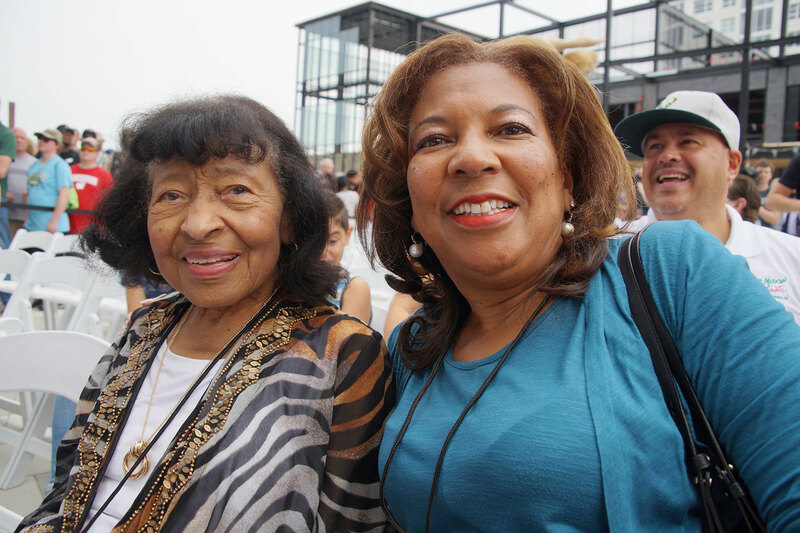 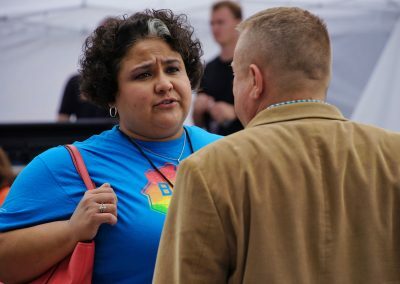 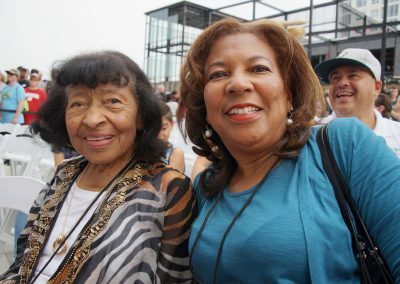 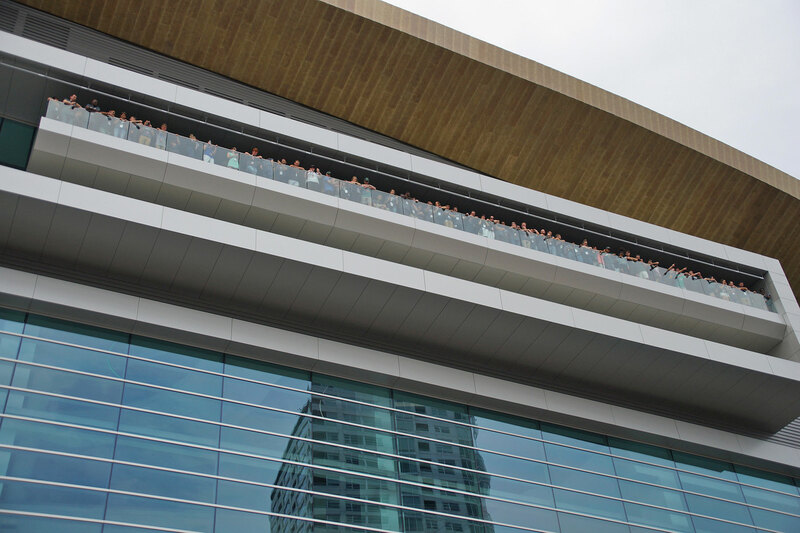 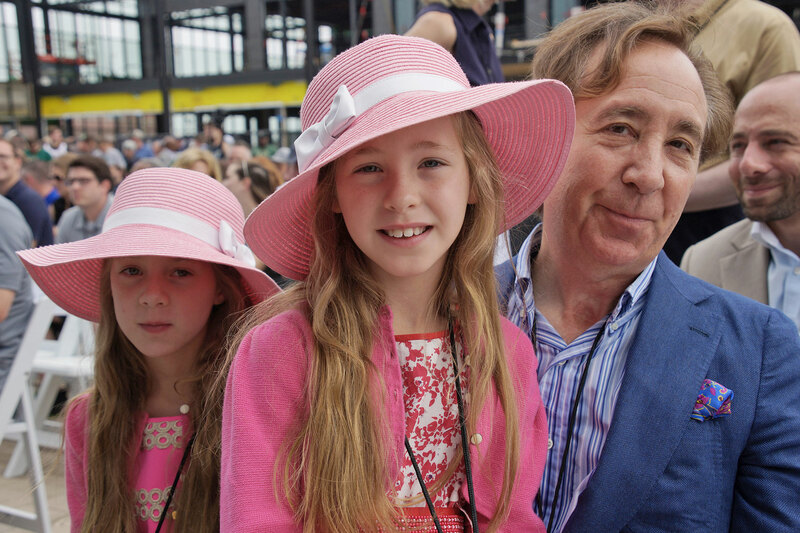 After the ceremony, an estimated crowd of more than 50,000 tour the new arena during the Open House, giving the community its first look inside the arena. 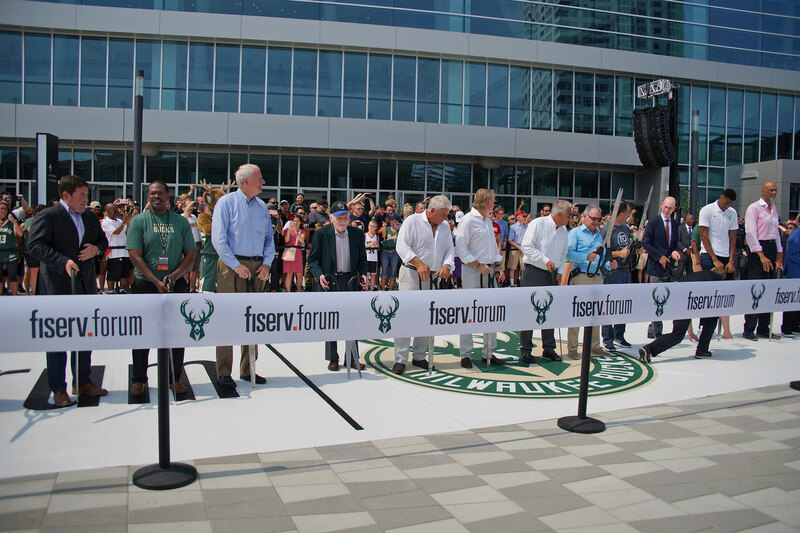 The world-class Fiserv Forum is the new home of the Milwaukee Bucks and Marquette men’s basketball team. 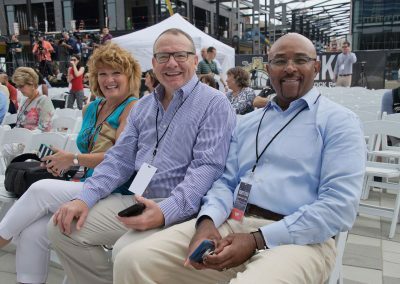 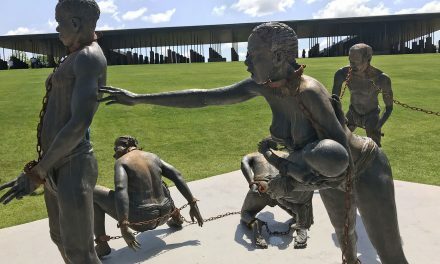 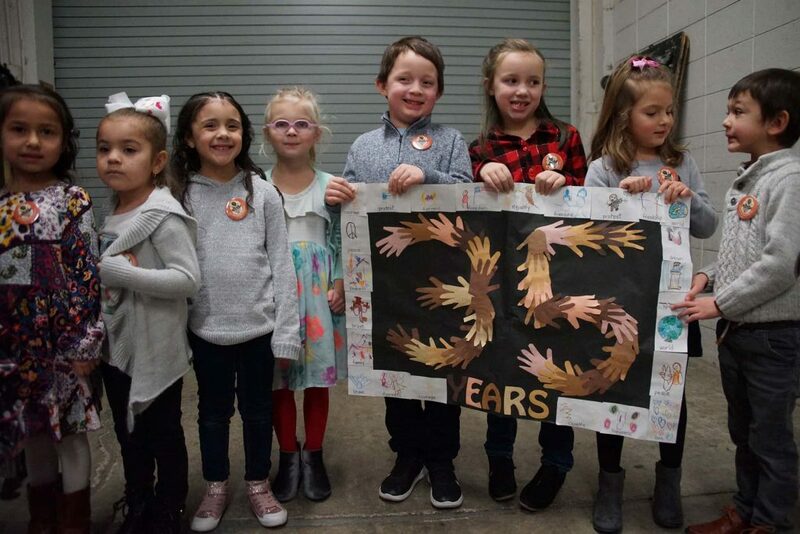 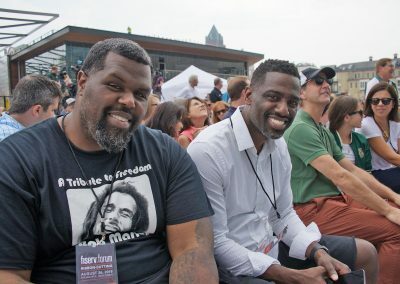 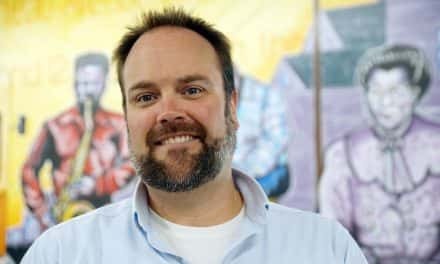 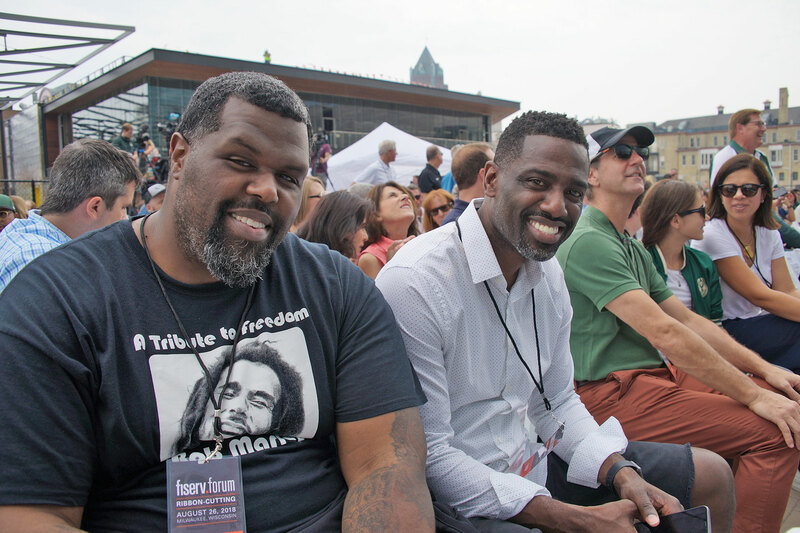 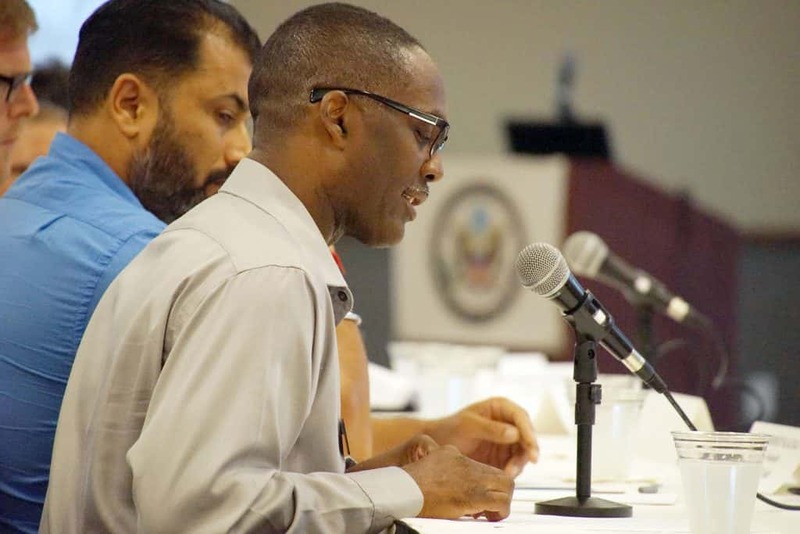 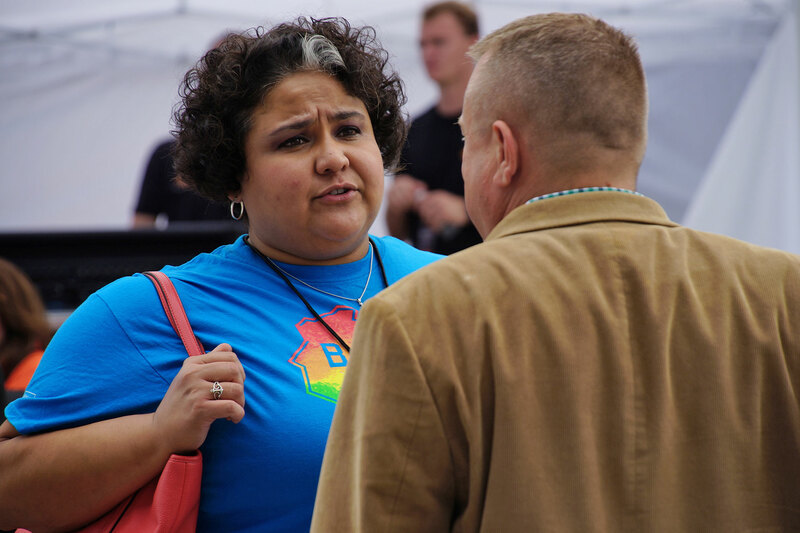 It will also host a variety of programming – 24 events have already been announced for the venue’s first year – including major concerts, family shows and other sports and entertainment events. 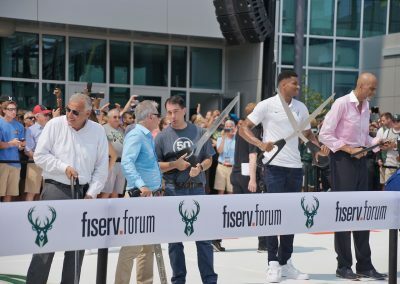 Global superstar rock band The KiIIers will perform the Grand Opening concert at Fiserv Forum with Milwaukee natives Violent Femmes on September 4. 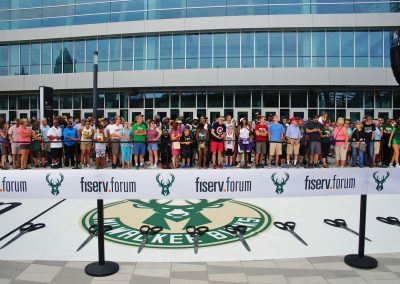 Fiserv Forum will seat 17,500 for basketball and up to 18,000 for concerts with incomparable sightlines from all vantage points. 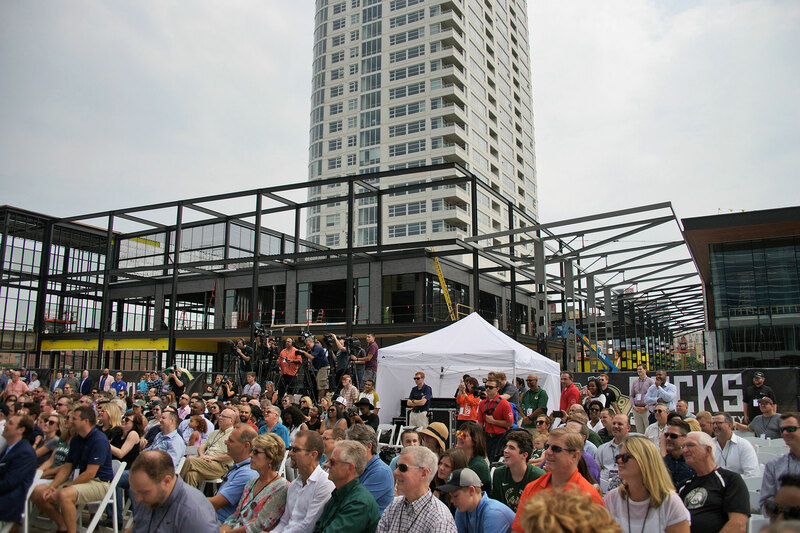 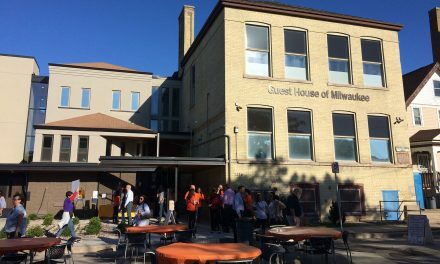 The arena has three clubs including the BMO Club, Mezzanine Club and Panorama Club, which is on the highest level of the building and features an outdoor terrace with sweeping views of Milwaukee’s skyline. 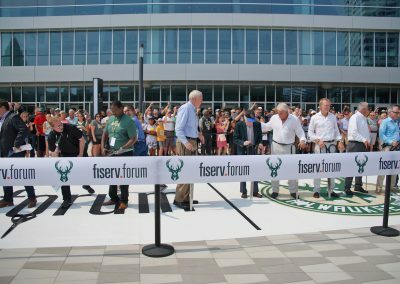 Premium seating in Fiserv Forum includes 34 private suites, West Bend Lofts and more than 800 club seats. 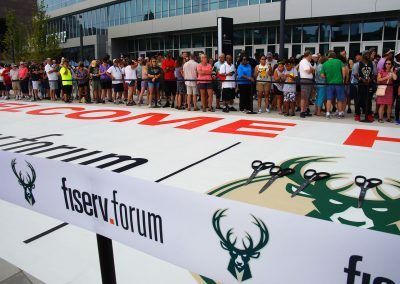 Fiserv Forum offers state-of-the-art technology, with more than 300 distributed antenna systems and 16 wireless access zones to allow for high-speed connectivity throughout the arena. 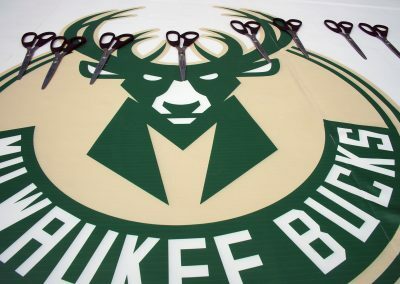 Daktronics outfitted the arena with over 12,000 square feet of video displays, including the centerhung scoreboard, which is more than 3,900 square-feet, making it the largest equilateral centerhung display in the NBA. Fiserv Forum also contains more than 800 high-definition flat screen televisions. 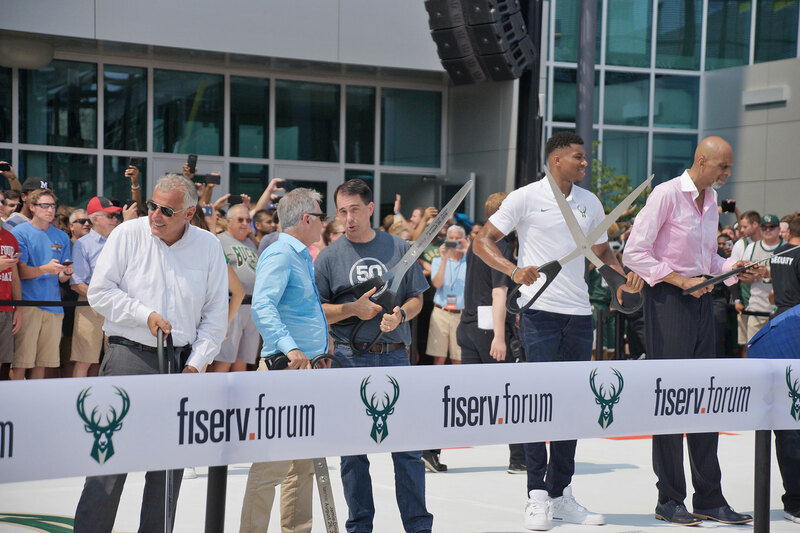 Fiserv Forum is redefining the culinary experience for a sports and entertainment venue by implementing MKEat, a dynamic, locally-focused food and beverage program. 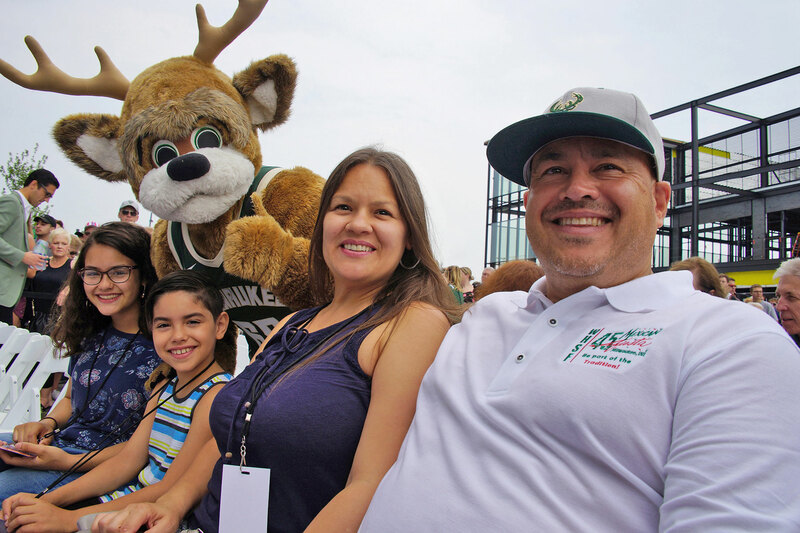 Led by Fiserv Forum Senior Executive Chef Kenneth Hardiman, and food and beverage provider Levy, MKEat features popular and diverse local culinary establishments throughout the venue’s 31 concession stands. 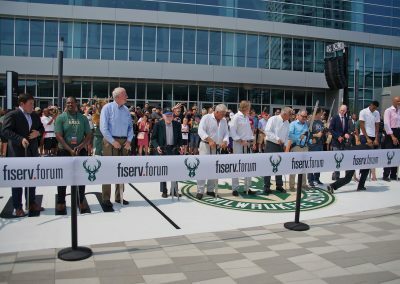 Fiserv Forum also contains five expansive kitchens. 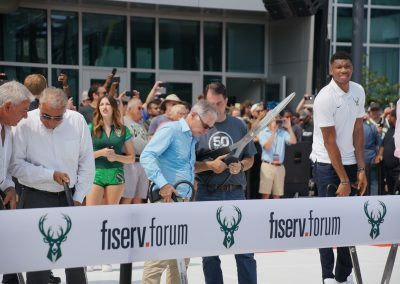 As a cultural center for the city, Fiserv Forum houses the Milwaukee Bucks Art Collection, which includes 79 original pieces and 43 photographs, created by 32 artists, 22 of whom have Wisconsin ties. 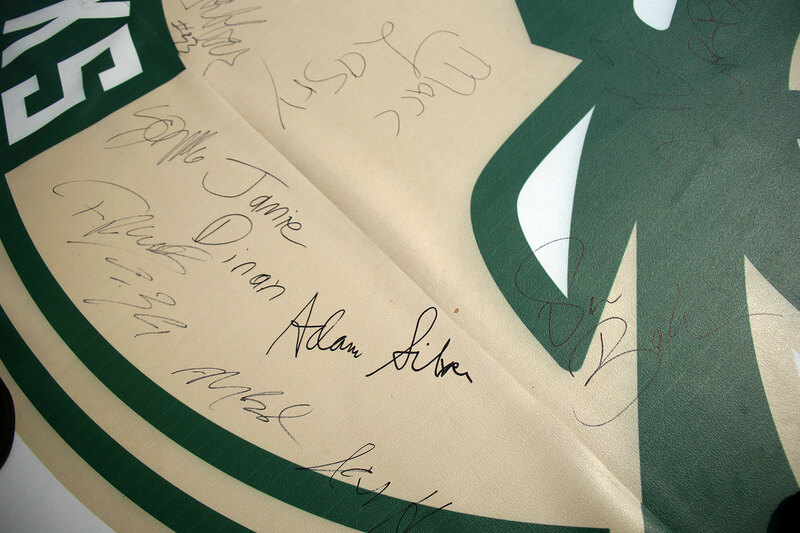 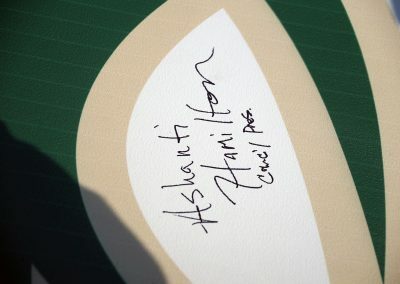 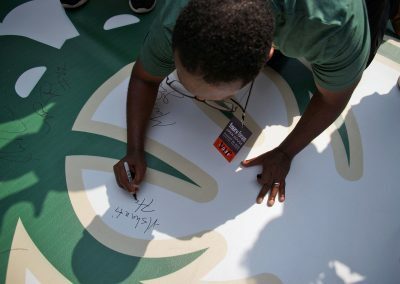 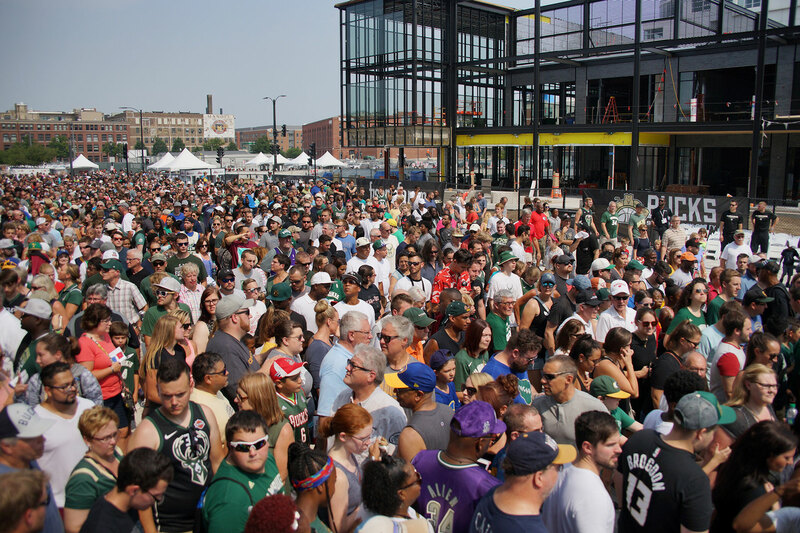 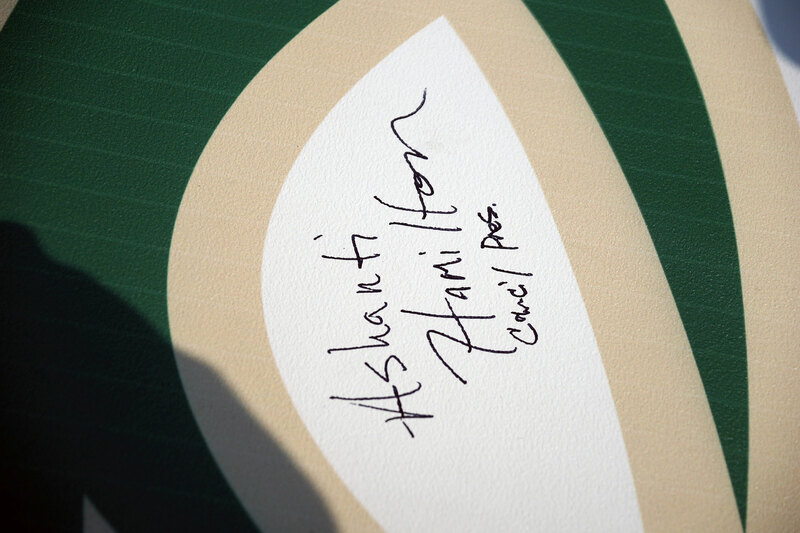 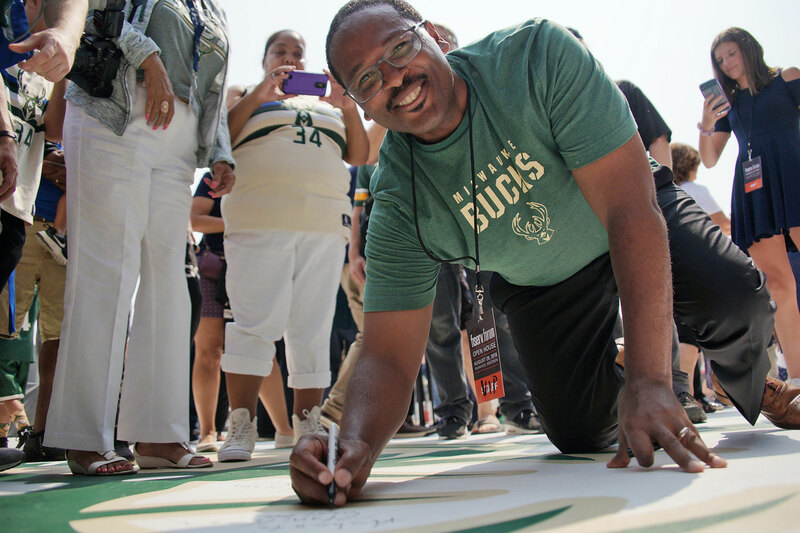 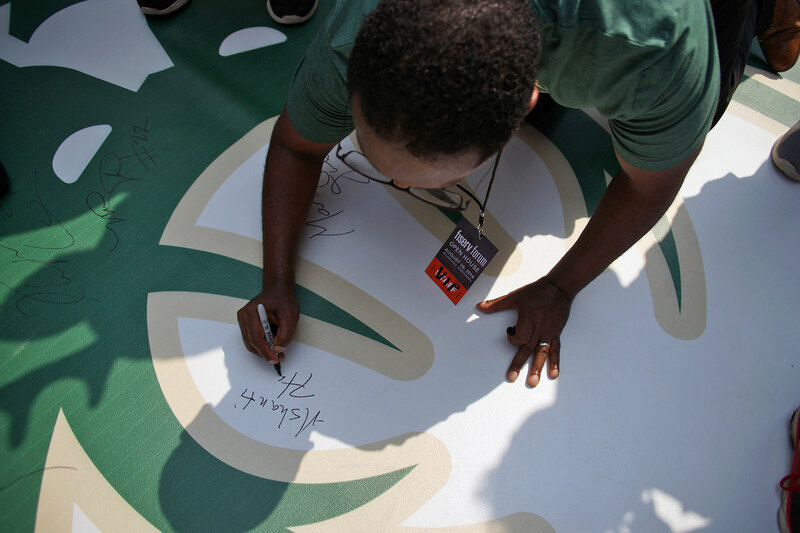 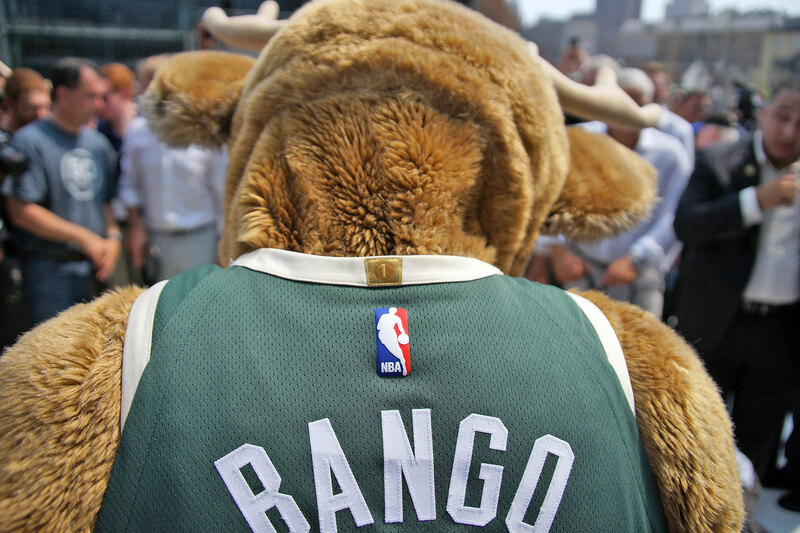 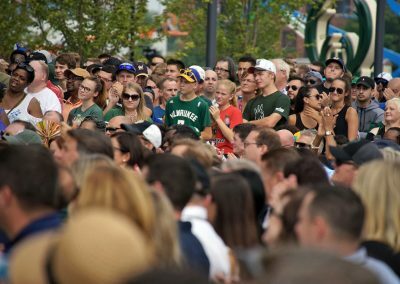 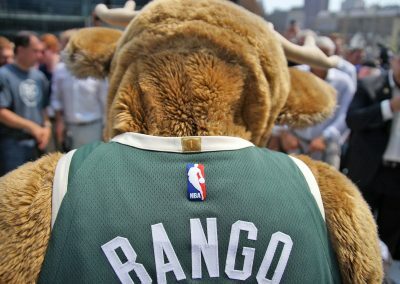 The Bucks collaborated with Sports & The Arts to secure an eclectic mix of artists and mediums. 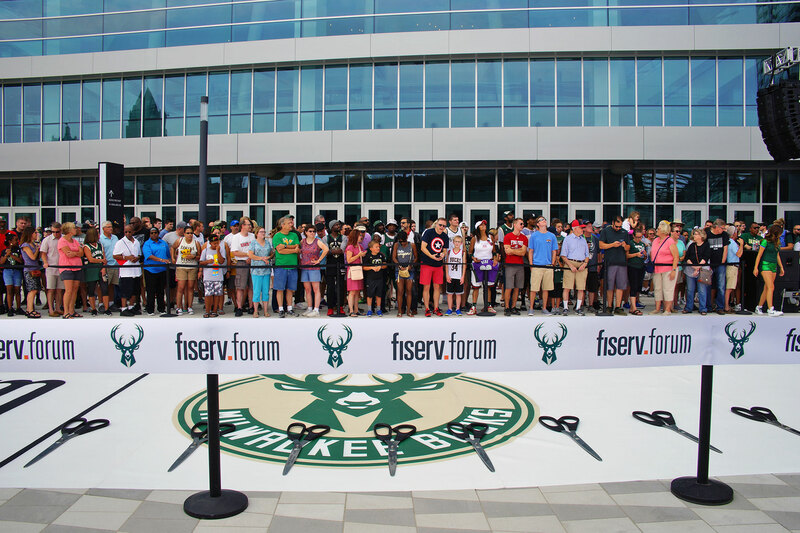 Fiserv Forum includes four Bucks Pro Shops and one kiosk, giving fans convenient locations to purchase a wide-selection of official Bucks gear. 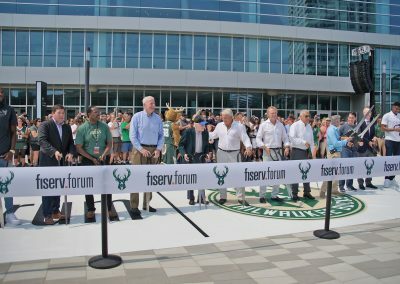 Fiserv Forum totals 730,000 square feet, stands 128 feet tall, and was built with more than 8,000 tons of structural steel. 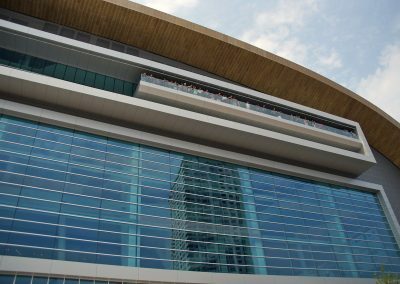 The sweeping north-side exterior façade of Fiserv Forum contains 80,440 square feet of zinc architectural panels. 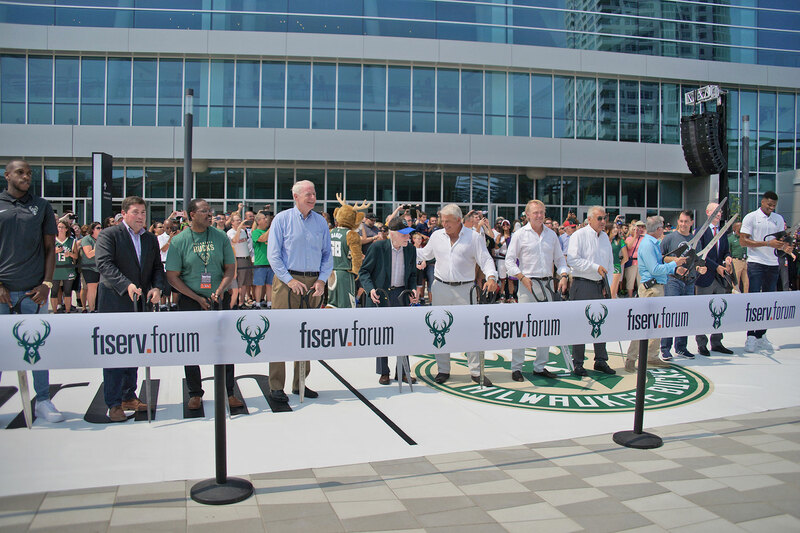 Fiserv Forum was designed by world-renowned Populous, and Wisconsin-based Eppstein Uhen Architects and HNTB. 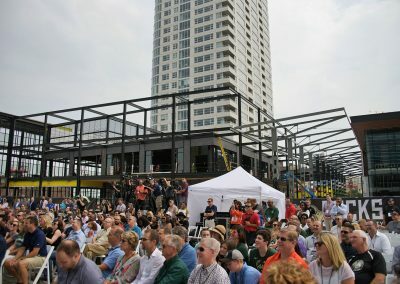 The owner’s representative for the project was CAA ICON, and the construction manager was Mortenson. 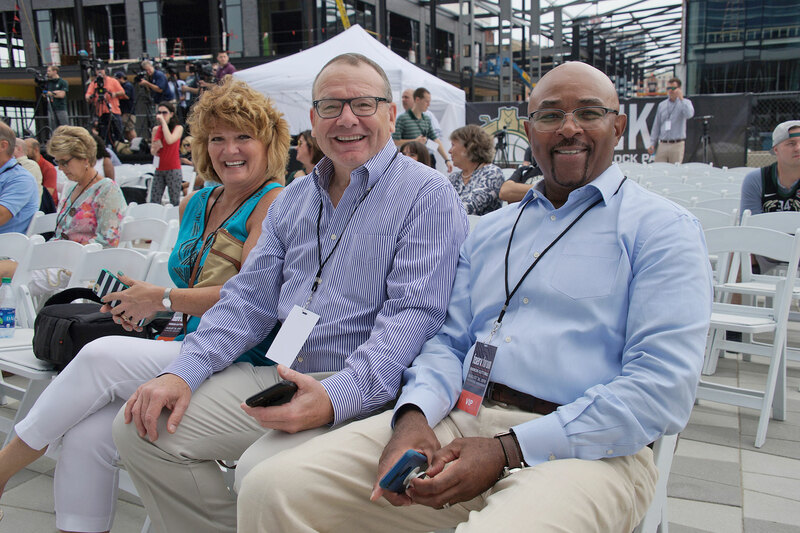 M-E Engineers was the mechanical engineer and the structural engineers were HNTB and Walter P. Moore. 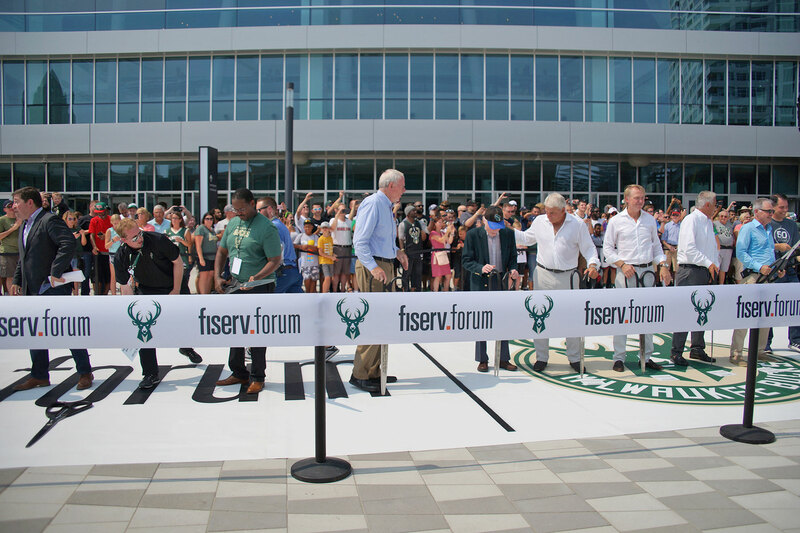 Fiserv, Inc. was announced as the naming rights partner for the arena on July 26. 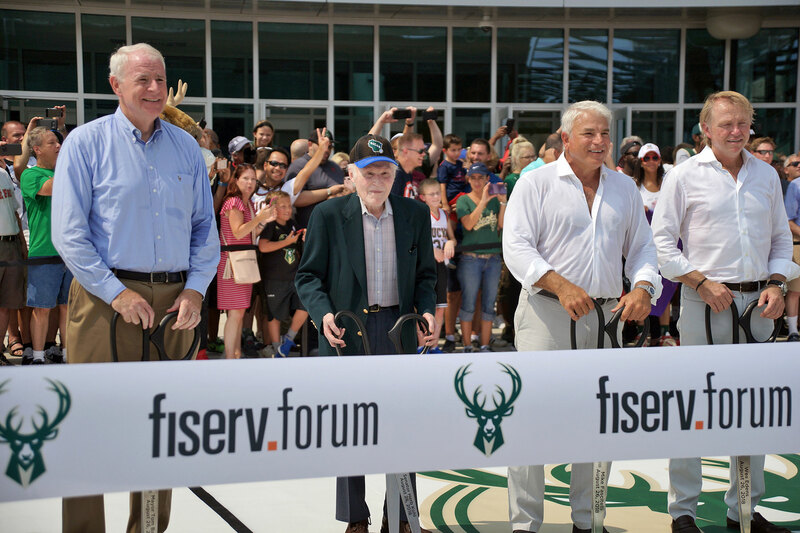 Founding partners for Fiserv Forum are BMO Harris Bank, Froedtert & the Medical College of Wisconsin, Johnson Controls and Miller Brewing Company.